“Funny thing about humans is, at our best we can be the most noble of animals, but if not governed by law and justice, some tend to become the monsters of all monsters! Money, power and fame are not vices in the right hands, but once they get into the monsters’ hands, and innocent lives are at stake, it’s a different ball game.” A ball game that doesn’t differentiate between family and the community. And the domino affect of this is the premise of Christy Reece’s Gray Justice Series, as it follows the Slaters and their rise from ashes of evil to a life of redemption and love, with the powerful Grey Justice at the helm, and to protect and serve and bring justice to the innocents that are pawns in the evil game of power, cartels and supremacy. Exonerating the false charges that landed Johan Slater in prison, sharing the same DNA of a monster father and a sibling that have been slain to ashes, Jonah Slater is flying on the wings of vengeance to bring justice to his murdered fiancée. Keeping Gabriella Mendoza safe from her cartel family is just another job to keep him occupied, never realizing that destiny is in his home. And he falls in love with a warrior woman, with a kind and tender heart. Planning her own abduction from her cartel family takes courage and patience and Gabriella has been trained very well to endure and wait for the right moment. An act that is supported and run by Justice and the consequences of it lands her in the protection of Jonah Slater, before she can be acclimated into a new life with a new identity. The pain, the horror and the torture that Gabby endures in the hands of her carter family is unfathomable and she manages to escape with her positivity still intact. And that pretty much sums up these amazing characters created by Christy Reece. “Too Far Gone” is Gabriella’s story of survival, courage, tenacity, and patience, all wrapped up in a package of kindness, affection and selflessness. “Too Far Gone” is evil for Jonah and he’ll protect what belongs to him with his last breath. No matter how far you run, the past has a nasty knack of playing catch up. No matter you’ve created an identity to start fresh, unless the past is erased, there cannot be hope of a future. Riley Ingram may have been “Running Scared” from the demons of her heinous past, but she has become a warrior at heart saving lives and becoming a daughter to Noah McCall. Paired with Justine Kelly and running ops with him for the past three years has given her purpose to love, hope to survive and a LCR family that covers her six no matter what. And working three years with Justin only seems to stoke the embers of desire and passion that refuses to diffuse between them. The past has come calling for Riley Ingram aka Jessica Larsen and the time has come for Jessica Larsen to pen the final chapter of her past and getting the answers she deserves of her identity and her roots. And we get a torturously amazing story of evil and danger, tenacity and courage, passion and love, support and family. I shall forever remember the morning after Riley and Justin spent a night together. The emotional conversation between Noah and Justin will be one of my favorite scenes. The confessional night between Riley and Justin will forever be one of the most heart wrenching and tearful dialogues I’ve read. And Riley and Justin will be one of my top favorites of Christy’s character in par with McKenna and Lucas (Last Chance). Christy Reece created another elite pair in Riley and Justin. Her attention to detail is amazing, her play of emotions and tenderness is a bullet to your heart, and her placement of supporting characters in the story only proves her prowess as a brilliant romantic suspense writer. A review definitely doesn’t do justice to her novels. Her books have to be read to endure the evil, live in the emotions, savor the passion and root for her flawed characters with her flawless writing! The wheels have been set in motion for Aidan and Anna, and I cannot wait to see how Christy Reece choreographs their story of a lifetime! Protect Loved Ones With Whatever It Takes! And the domino affect of this is the very essence of the following stories of the entire series written by Christy Reece. There is no doubting the writing prowess of Christy Reece!!!! Her ability to create characters with courage, integrity and empathy, her brilliance in weaving stories of loss and pain, see-sawing between the lines of white and black, connecting the players with the past and bringing a closer in the present for a future for each, Christy is one of the most compelling writers of romance thrillers I’ve had the pleasure of reading. I am a sucker for the underdog and the fallen rising with a vengeance to beat the odds, and of women who overcome their fears and betrayal to come out the other side with courage and integrity. For this alone Eli Slater will be one of most favorite fictional characters and along with Kathleen, one of my courageous couples of fiction times! ‘Chance Encounter’ can be deadly enough to break a soul. 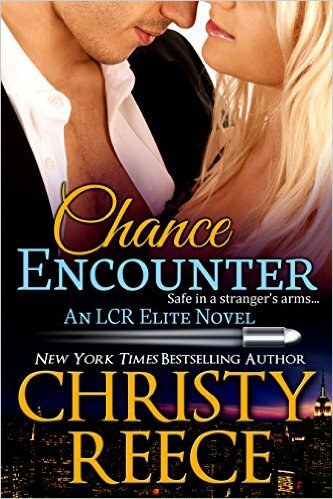 ‘Chance Encounter’ can be a balm in the night of deadly shadows and a ‘Chance Encounter’ can be the very epitome of love that endures to fight for their destiny. The LCR Elite has a new member in the savvy and fallen quarterback Brennan Sinclair. With a past that refuses to fade and a guilt that seems to eat him from the inside, his first mission with the LCR Elite lands him under the roof of the beautiful and wholesome Kacie Dane. Another fallen angel to the evil of the world, enduring the naked scars of pain, Kacie Dane always has a smile for the world. Embracing her profession as a model, pouring her inner pain into Kacie Dane Foundation, she channels her nightmares into strength and courage, giving back to the world in her very small means. But when her torturous past threatens her life, Brennan steps in with his support and empathy, love and security, and the entire LCR family weaves a shield of protection. And that very shield stokes the embers of lust and passion, and the need for companionship brings Brennan and Kacie into the folds of love. “Chance Encounter” gives us a chance to know two wonderful characters with so much strength and courage makes us tear for their pain and loss. Two good people, who got the wrong end of the deal, yet fate throws them into the hands of destiny, smile with each other and pass those very smiles around. Christy does a stupendous job of portraying their inner demons, feelings and thoughts, that you cannot but help laugh and cry along with them. What I love about Christy Reece is her amazing creativity of characters, so broken yet redeemable. She can write adrenaline and heart racing romantic suspense and thrillers and on the other end of the spectrum is her sublime romance and immense depth of feelings. All her stories may not have to be bloody and pure evil to send the message across. Evil and love can romance at a sublime level in her stories and she does a brilliant job of narrating them. This is one of her very best of best works that I will revisit several times and Kacie and Brennan will take a very close second to my favorites McKenna and Luke (Last Chance).